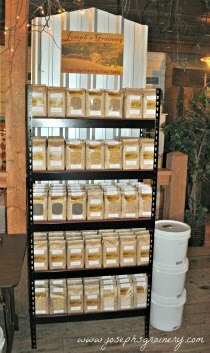 Want to buy local whole grains and freshly ground flours? Now you can do just that at several of the Yoke's Fresh Market locations! Stop by any of these Yoke's and ask for Joseph's Grainery products by name! In these fine Yoke's stores you'll find us in their Nature's Corner, but of course, if you can't locate your favorite Joseph's Grainery products, just ask for us by name! Grandpa and I think this Minneapolis Moline Tractor outside of the Argonne Yoke's is especially neat!